Grand Rapids MN Tires & Wheels | Acheson Tire Inc. Welcome to Acheson Tire Inc.
Acheson Tire Inc. has been your local tire dealer in Grand Rapids, Minnesota for years. That's years of service to generations of families across our part of Itasca County, including Hibbing, MN and Deer River, MN. It's thousands upon thousands of tire sales paired with decades of tire services. It's countless happy customers. Visit our tire shop today and become a part of our tradition. When it comes to finding new tires or taking care of your current set, you can always count on our technicians to assist. We can help you find the right tire size and style for your car, truck, or SUV and the type of driving you do. The tire industry has grown dramatically over the last century. Our inventory includes brands that have proven their merit over time, like Bridgestone, Firestone, and Toyo. 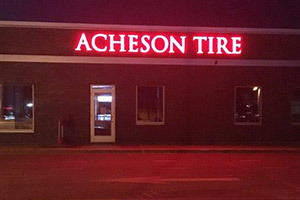 Located at 203 Northeast 5th St. in Grand Rapids, Acheson Tire Inc. is open Monday through Friday 7:30 AM to 5:30 PM and Saturday 8:00 AM to 12:00 PM. Call (218) 326-4319 to speak with us today. Find and compare brand name tires on your time in the comfort of your home. Not sure what tire your vehicle needs? No worries. You can shop online by vehicle make and model. Other search options include by tire size and brand. Give it a try and compare our options online to find the best tire for your vehicle and driving style.